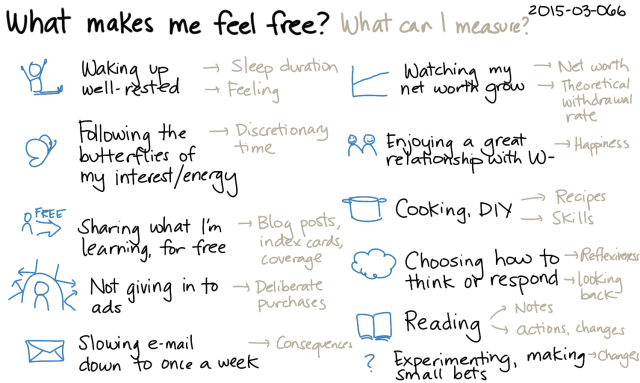 In addition to those two easy metrics, there are a few other things that contribute to a feeling of freedom for me. How often do I have to wake up to an alarm clock, or can I sleep until I feel well-rested? Am I starting to be stressed because of commitments? Do I have to juggle or cut back? Can I follow the butterflies of my interest/energy, or have I promised to do a specific thing at a specific time? Can I share what I’m learning for free, or am I restricted by agreements or by need? Am I getting influenced by ads to want or buy things that I don’t really need? Do I experience buyer’s remorse, or do things contribute to clutter? Is it easy to remember my decisions or my values in the din? Do I have the space to enjoy a great relationship with W-? Can I make the things I want? Do I have the skills to create or modify things? Am I reacting or responding? How reflexive is my ability to see things in the light that I would like to see them in, and to respond the way I would like to respond? Can I learn about what I’m curious about? Do I use it in real life? Can I make small bets and learn from them? I think it’s because I tend to think of freedom as freedom from stress and freedom to do things – maybe more precisely, to live according to my choices without having to choose between deeply flawed options. I’m in a safe, rather privileged situation, so I’m not as worried about freedom to live or move or speak or learn; those are more important freedoms, for sure! So with the definition of freedom I have, I feel pretty free. Based on my impressions from conversations with other people, I think I’m probably in the top 10% of freedom in terms of people I know. Or at least a different sort of freedom; I’m more risk-averse than some of my friends are, for example, so they’re freer in that sense. 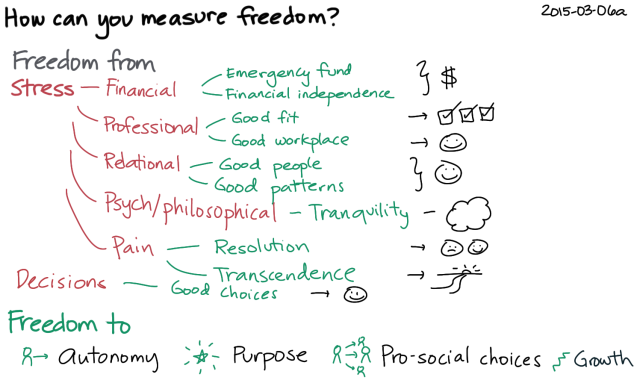 If you break down the abstract concept of freedom into different types of freedom, you can figure out which types resonate with you and which ones don’t. You might then be able to think of ways to measure the specific types of freedom you’re curious about, and that will help you get a sense of areas in your life that you may want to tweak. Philosophy has a lot to say about freedom, so that’s another way to pick up ideas. The biggest freedom, for me – the one I most want to cultivate and keep – is the freedom that comes from choosing how I perceive the world and what I do in response. I like the freedom described in Epictetus’ Discourses. How could I measure this or remind myself about this? Since it’s entirely self-willed, I can keep track of whether I remember to take responsibility for my perceptions and responses and how easy it is to do so. I imagine that as I get better at it, I’ll be more consistent at taking responsibility (even if I realize uncomfortable things about myself) and that I’ll do it with more habit. I can also track the magnitude of things I respond to. I know that I can maintain my tranquility with small events, and I’ll just have to wait and observe my behaviour with larger ones. What does freedom mean to you? How do you observe or reflect on it?